Arianespace’s tenth mission of 2018, designated flight VA246, orbited satellite payloads for the Indian Space Research Organisation (ISRO) and the Korea Aerospace Research Institute (KARI), and was the sixth launch this year using the workhorse Ariane 5. 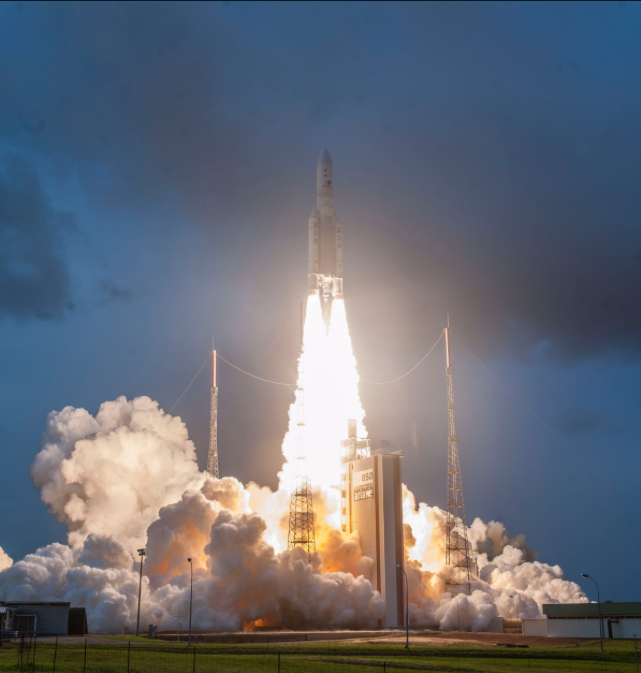 In its final launch of 2018, Ariane 5 placed two satellites in geostationary transfer orbit (GTO), lifting off from the European spaceport in Kourou (French Guiana). GSAT-11 is a telecommunication satellite relay platform for Ku- and Ka-band communications, while GEO-KOMPSAT-2A is designed to provide Earth and space weather monitoring data. “I want to express my deepest gratitude to two very special partners since the beginning of their space ambitions: ISRO and KARI,” said Arianespace's CEO Stéphane Israël in post-launch comments from the Spaceport. This launch placed two satellites in orbit, with a total mass of 9,362 kg. The total performance required of the launcher was 10,297 kg, with the ACU (payload adapters), the SYLDA (Ariane dual launch system) and the LVA 3936 (Launch Vehicle Adaptor). The orbit was optimized as the result of the power of the Ariane 5 ECA launcher, that enabled the payloads to be placed in a transfer orbit with a reduced inclination of 3.5 degrees (instead of the usual 6 degrees). “With these six launches in 2018, Ariane 5 once again demonstrated its performance and flexibility, notably by placing, for the third time, four Galileo satellites in orbit, by placing BepiColombo in its release orbit on the way to Mercury, by celebrating its 100th launch and by once again demonstrating its ability to launch more than 10 metric tons to geostationary orbit. I extend my warmest thanks to the teams at ArianeGroup and those of our subsidiary Arianespace for the work accomplished on this sixth launch of Ariane 5, marking the end of an intense 2018. The Ariane 5 successes, are paving the way for the future successes of Ariane 6. I would once again like to express my gratitude to the European Space Agency and the CNES for their confidence and their unflagging support,” said Alain Charmeau, CEO of ArianeGroup. As the industrial lead contractor for development and operation of the Ariane 5 and Ariane 6 launchers, ArianeGroup coordinates an industrial network of more than 600 companies in 13 European countries, including more than 350 Small and Medium Enterprises (SMEs). ArianeGroup oversees all the industrial activities, from the performance improvements and studies necessary for Ariane 5 up to its production, the provision of data or software specific to each mission, without forgetting marketing activities via Arianespace. This chain includes equipment and structures, engines manufacturing, integration of the various stages and finally launcher integration in French Guiana. Israël noted that GSAT-11 was the 22nd ISRO satellite orbited by Arianespace and Ariane-series launchers, tracing the relationship back to India’s APPLE small experimental communications spacecraft, which had a liftoff mass of 670-kg. and was lofted in 1981 by an Ariane 1 version. On today’s Ariane 5 mission, GSAT-11 weighed in at 5,854.6 kg. – the largest and heaviest satellite ever built by the Indian space agency. Deployed first during Ariane 5’s 33-minute mission to geostationary transfer orbit, GSAT-11 will be positioned at 74 deg. East, providing communications services in Ku- and Ka-bands in both forward and return links. The satellite was designed and manufactured by ISRO, with its multi-spot beam coverage over the Indian mainland and nearby islands to bring significant advantages to users when compared with existing India’s INSAT/GSAT satellite systems. GSAT-11’s design lifetime is more than 15 years. 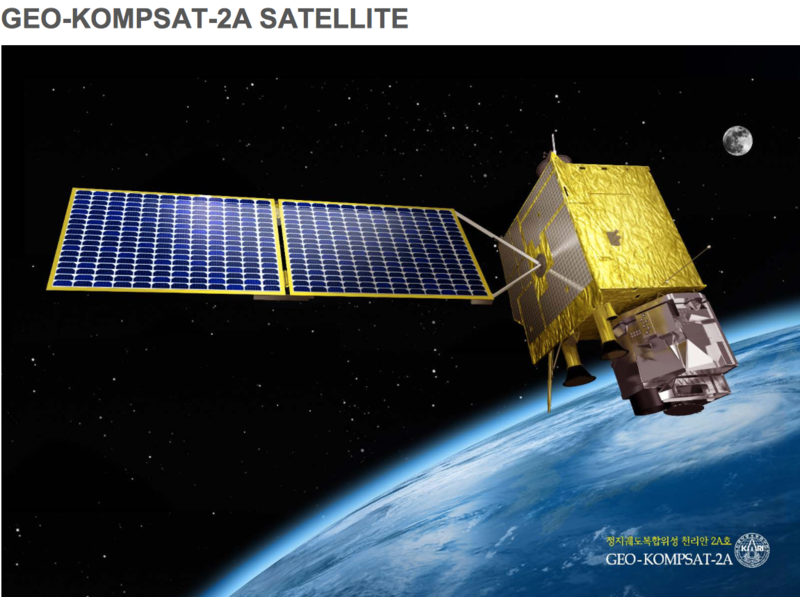 GEO-KOMPSAT-2A was carried in Ariane 5’s lower payload position and released second in the sequence for Flight VA246. Developed by KARI at its South Korean facility in Daejeon, this 3,507.2-kg. satellite will deliver meteorological and space weather monitoring from an orbital position of 128.2 deg. East as part of a Korean government national program. In addition to the Ariane 5’s payload fairing logos representing Flight VA246’s two satellite passengers, also included was a decal recognizing the French city of Les Mureaux — home to the ArianeGroup site responsible for integration of Ariane 5 cryogenic main stages today, and for Ariane 6 launchers in the future. Les Mureaux is completing its year-long presidency for the Community of Ariane Cities, a non-profit association that brings together cities and their industrial companies involved in the Ariane program.